Dragon Age: Origins is a dark heroic fantasy roleplaying game developed by BioWare set in a unique world. And we have 10 digital copies to give away with all of the downloadable content included for PC users! As the spiritual successor of BioWare's popular Baldur's Gate series of games, Dragon Age: Origins uses a pause-and-play tactical combat system. It also features a stunning amount of cinematic dialog, a deep and involved story with complex and living characters. You will be able to acquire party members on your journey, each with their own unique story and motivations. Luckily for The Escapist community, BioWare has given us ten (10) prize packs to give away to our PC users. Those who can answer our quiz 100 percent correctly will be put into a random drawing for one of the prize packs. UPDATE - PLEASE READ: BioWare has just contacted us and is adding a bonus to the prize packs, their newly released DLC "Leliana's Song" which was released today! For more information about "Leliana's Song", please click here. For a list of rules and how to participate, please click here and good luck! Please note, you must be 18 to participate in this event. Such a shame I am only 16. Ah well, guess I can wait for the Hello Kitty contest. Calumon: Or maybe the Bob the Builder Contest! All you have to do is tweet something about Dragon Age: Origins or Doraleous and Associates once per day (each) until July 5th. So... we have to tweet about this until yesterday? surely if you know the answers to the quiz you already have the game? 18 and over strikes again. Entered my birthday wrong! xD DAMN YOU!!! SCREW YOU! I'm not 17 so I can't enter :( Can I send the escapist a note from my parents saying it's ok for me to get this game. Well I already have half of those... I just disappointed myself. But eh, why not, I'll enter. Anyone else find it ironic that in order to participate, you need to pass a quiz that shows how knowledgeable you are about the game? That seems to make sense only for people who have already played it! 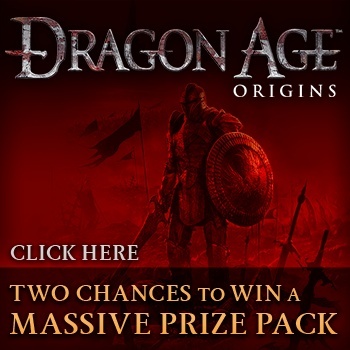 It's a funny reward for Dragon Age fans to receive another copy of Dragon Age. The DLC makes it a little less nonsensical. Silly save button :) Through July 11th. how come you can buy this game in the store if your 17 but cant win it online or watch videos about it? All the answers can be found on their homepage. Well I already have the game on the 360 and my PC would explode if I trying running it on here... So the prize isn't worth much to me... But hey I'll still enter the competition just for the Lulz. Wait, so you don't have to live in the US for this competition? I already own "Dragon Age: Origins" and all it's material. A non US only contest? Fantastic! I already have Dragon Age but i'd appreciate the DLCs. I'm not going to tweet though, maybe once but not every day. I'm not going to demean myself by spamming my followers every day to show them how desperate i am. What moron thought of that? What moron thought of that? i already have dragonage, stone prisoner and blood dragon armour, but the rest of the DLC would cost around 1.5 times as much as DA:O. Seriously, I have it for the 360 but I want it on the PC. So yes please, I am signing in, unless it's an USA-only contest. I would seriously cry balls if this was the case. I would really love this, but unfortunately I'm not 18 and I already have all of this, and the rest of the DLCs. Well it was more of a rhetorical question, but sorry if i offended you. It may have also been poor judgment to write that... Anyway, tweeting once is fine, great even, to spread the heat and feel like you're a part of it, but every day, really? Sure, if someone really wants more chances to win. I like to give people more than one option to win if I can but not needed to enter. Why am I answering these absurdly specific late-plot-oriented questions about a game I'm hoping to win? If I know these answers, I would've played it already, and hence wouldn't care about winning it. I gave up at the end, because to the uninitiated the questions read like incomprehensible gibberish about an alien culture on Mars. No doubt this stuff must be spoilers to the games. Seems a very poorly thought out contest. This is the first contest that I can enter as a non-US/Canadian citizen. Plus, other than what I got from purchasing my copy, I don't have any of the DLC. While I had no intention of buying any, participating in a contest to potentially get it for free still sounds compelling. I wish game related contests would stop using Twitter as the major part of participation. I don't have a twitter, I don't want a twitter, and I'm not going to get a twitter. Most other places, I just put up with it, but this is The Escapist, this is a gaming site. I don't want to use the current social networking fad to participate in contests, I would much prefer for the majority of the entry methods to be gaming based. I understand using twitter as one of the ways to participate. After all, twitter is the current big fad and most everyone doesn't share my old manish sentiments about social networking. But twelve entries from it as apposed to the two you can get from gaming related entries? Really? That doesn't seem a bit much? How about a few more gaming related entry options and a few less tweets, or heck make it so that you can just post a comment on the forums once per day to the same effect. It's too bad you can't exchange the prize for the 360 Equivalent. My computer doesn't even meet Dragon Age's minimum specs. Why do I feel the strong need to agree with you?